This code is intended to control the impact on ‘people, businesses and the natural and historic environment’ during the construction of the HS2 line. This is particularly important for the historic environment, which is the society's concern. The good news was that this draft document was much more robust than its companion draft Environmental Statement. The draft code specifically covers both designated assets – such as Scheduled Monuments and listed buildings – and undesignated assets such as ‘archaeological [and] geological deposits that may contain evidence of the human past, historic landscapes ... and locally designated assets’. For these the Code would determine standards of protection, or excavation where necessary. • the need to ensure that areas of Buckinghamshire known for finds of fossils of Ice-Age mammals to be investigated in advance, before heavy earth-moving equipment moves in. 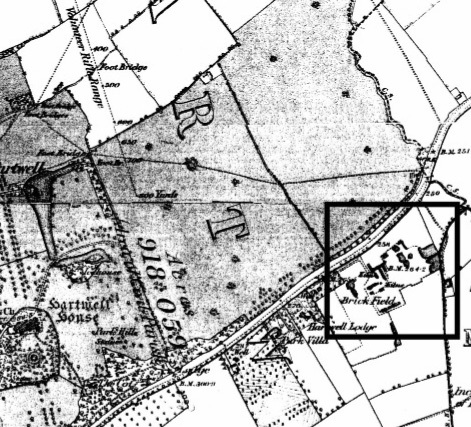 A section of the Ordnance Survey map of 1877-80 showing Hartwell House, west of Aylesbury, and highlighting ‘Locke's Pit’, where the bones of prehistoric animals were found. HS2 construction work will disturb this area.